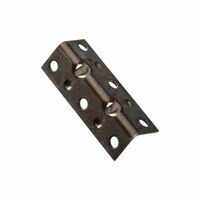 National Hardware Corner Brace, Series: 117BC3, 3/4 in Length, 1/2 in Width, 0.07 in Thickness, 2 Mounting Holes, 0.29 in Diameter X 82 deg Countersunk Mounting Hole, Steel, Zinc Plated, Includes: Screws, BHMA A138.18, For Chests, Screens, Windows and Furniture Reinforces right angle corner joints. Use both indoors and outdoors. Rust resistant. Reinforces right angle corner joints. Use both indoors and outdoors. Rust resistant. Reinforces right angle corner joints. Use both indoors and outdoors. Rust resistant. Adds extra support to right and corner joints. Rust resistant. 2.0 mm thickness. Reinforces right angle corner joints. Use both indoors and outdoors. Rust resistant. Reinforces right angle corner joints. Use both indoors and outdoors. Rust resistant. Adds extra support to right and corner joints. Rust resistant. 2.0 mm thickness. Designed for chest, screens, windows and furniture. Hole sizes fit Phillips flat screws sized #7. Drill a pilot hole with a 3/32" sized drill bit when using wood screws. Designed for chests, screens, windows, furniture, etc. 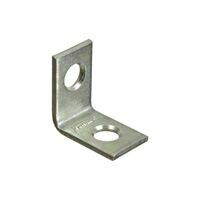 Used for reinforcing inside of right angle corner joints. Screw holes are countersunk. Boxed loose barcoded. Designed for chest, screens, windows and furniture. Adds extra support to right and corner joints. Rust resistant. 2.0 mm thickness. Reinforces right angle corner joints. Use both indoors and outdoors. Rust resistant. Hole sizes fit Phillips flat screws sized #7. Drill a pilot hole with a 3/32" sized drill bit when using wood screws. Designed for chests, screens, windows, furniture, etc. Used for reinforcing inside of right angle corner joints. Screw holes are countersunk. Boxed loose barcoded. Reinforces right angle corner joints. Use both indoors and outdoors. Rust resistant. Reinforces right angle corner joints. Use both indoors and outdoors. Rust resistant. Reinforces right angle corner joints. Screw holes are staggered in 5" and larger. Use to move light to medium weight furniture. Hard plastic wheels. Hole sizes fit Phillips Flat Screws sized #5. Drill a pilot hole with a 5/64" sized drill bit when using wood screws. 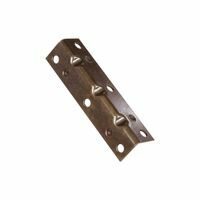 Used for reinforcing inside of right angle corner joints. Product design allows for quick and easy repair of general household items. Double wide brace for greater stability. Screw holes are countersunk. Visual-pack. Hole sizes fit Phillips Flat Screws sized #6. Drill a pilot hole with a 5/64" sized drill bit when using wood screws. Used to square and reinforce 90 degree angle corner joints. Two sided, wraps around wood at corners for a more secure hold. Product design allows for quick and easy repair of general household items. Screw holes are countersunk. Visual-pack. Reinforces right angle corner joints. Use both indoors and outdoors. Rust resistant. Hole sizes fit Phillips Flat Screws sized #6. Drill a pilot hole with a 5/64" sized drill bit when using wood screws. Used to square and reinforce 90 degree angle corner joints. Two sided, wraps around wood at corners for a more secure hold. Product design allows for quick and easy repair of general household items. Screw holes are countersunk. Visual-pack. 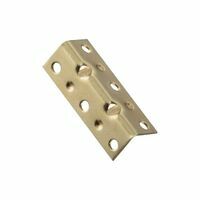 Hole sizes fit Phillips Flat Screws sized #8. Drill a pilot hole with a 3/32" sized drill bit when using wood screws. Used for reinforcing inside of right angle corner joints. Product design allows for quick and easy repair of general household items. Heavy duty, three sided construction. Screw holes are countersunk. Hole sizes fit Phillips Flat Screws sized #6. Drill a pilot hole with a 5/64" sized drill bit when using wood screws. Used to square and reinforce 90 degree angle corner joints. Two sided, wraps around wood at corners for a more secure hold. Product design allows for quick and easy repair of general household items. Screw holes are countersunk. Visual-pack.